The Salona 33, the baby of a six-model lineup, can be ordered to suit a racer or weekend cruiser, and neither side will feel short-changed when the boat is taken out for a different purpose from time to time. We have been spoiled by big boats. With their amenities, large sailplans and customizable features, it has been a big-boat world for over a decade. It was therefore refreshing to step aboard a 33-footer that offers choices and can change according to owner needs. The Salona 33, the baby of a six-model lineup, can be ordered to suit a racer or weekend cruiser, and neither side will feel short-changed when the boat is taken out for a different purpose from time to time. 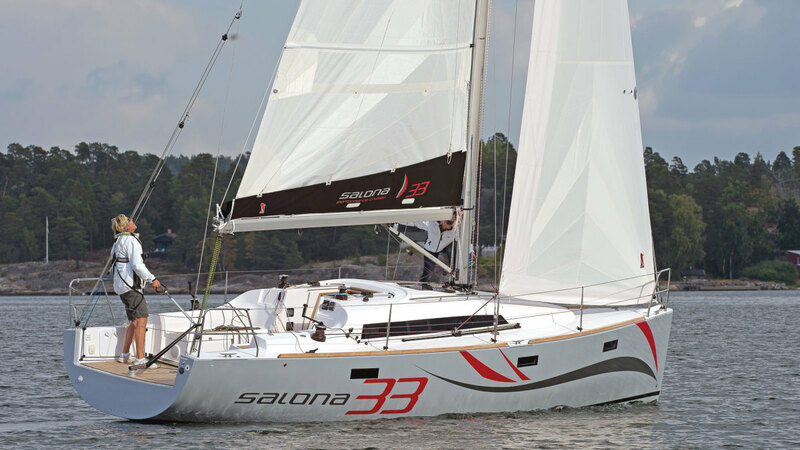 The Salona 33’s low profile shows an attractive boat with a plumb bow, no hard chines and a nearly straight, open transom. Despite her diminutive proportions in comparison to the 50-footer in the slip beside her, I noticed she looked serious, even a little aggressive—like she meant business. The hull construction is of hand-laminated, vacuum-bonded polyester with a PVC foam core above the waterline. The hull liner is reinforced with carbon fiber in high-stress areas, and the fore and aft bulkheads are watertight. An unusual feature—and one that is much touted by the Croatian builder—is the integral stainless-steel grid below the cabin sole and just above the keel, which ties together and spreads the loads of the keel, rig and hull. It certainly adds to the boat’s not-insignificant 10,912lb displacement, and there is always a concern about metal so near the bilge, since even stainless isn’t corrosion free given the right (or wrong) circumstances. Nonetheless, the structure makes for a hull that is both exceptionally strong and stiff. Below the waterline, the Salona 33 offers a T-shaped bulb keel with a draft of either 5ft 9in or 7ft 1in. For the racing-minded, the keel can even be optimized to IRC or ORC standards. There is a single, deep elliptical spade rudder that grips well and makes the boat very responsive. 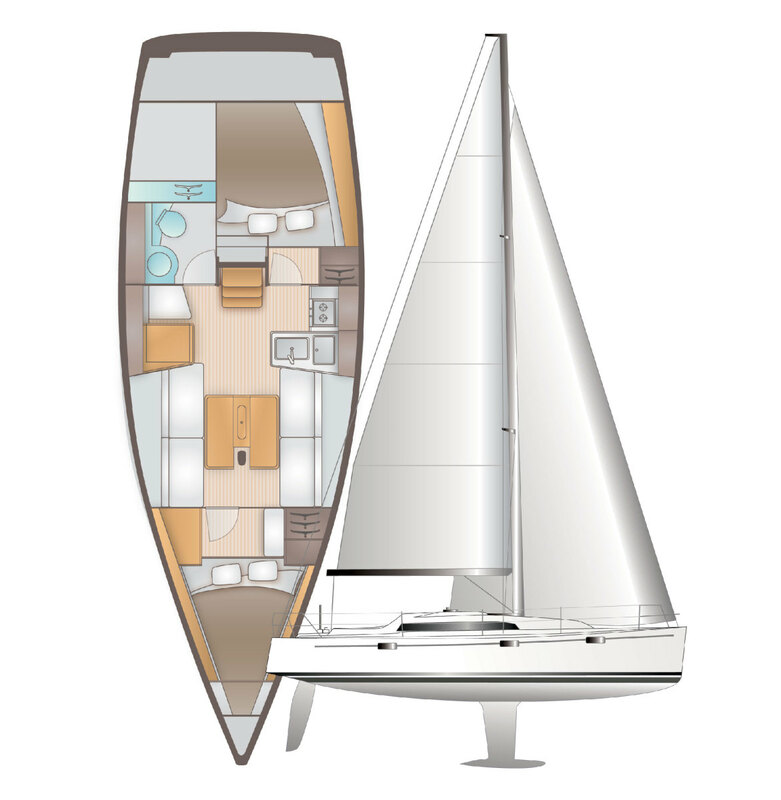 The 9/10ths fractional rig carries double, aft-swept spreaders and a working sail area of 747ft² that is divided between an overlapping genoa and a traditional, fully battened main. Cruising sails from North or laminated performance sails are available. The standard Seldén aluminum mast is keel-stepped. A carbon mast is also an option. The rigging is a discontinuous wire with a split, cascading backstay. Four Harken winches, two primaries and two on the cabintop, manage the lines aboard. Unexpected touches aboard this 33-footer include a belowdecks Harken genoa furler and an optional recessed bowsprit. Carbon fiber hatches are a nice touch too. Long stainless steel handholds line the cabintop, and the decks are clear, so it’s easy to move about quickly, even in racing mode. A tiller is standard, but twin wheels are an option, which makes the Salona one of the smallest twin-helm boats I’ve sailed. The transom is open, but has the option for a full-beam seat that also provides a bit of security for anyone moving about behind the wheels. The recessed traveler bisects the cockpit sole and provides end-boom sheeting. With the optional table removed, the cockpit is set up well for club racing. With it in place, sundowners can be served in comfort when the day’s racing is done. The Salona 33’s interior is surprising in both its size and amenities, primarily because she looks so sleek and low on deck. 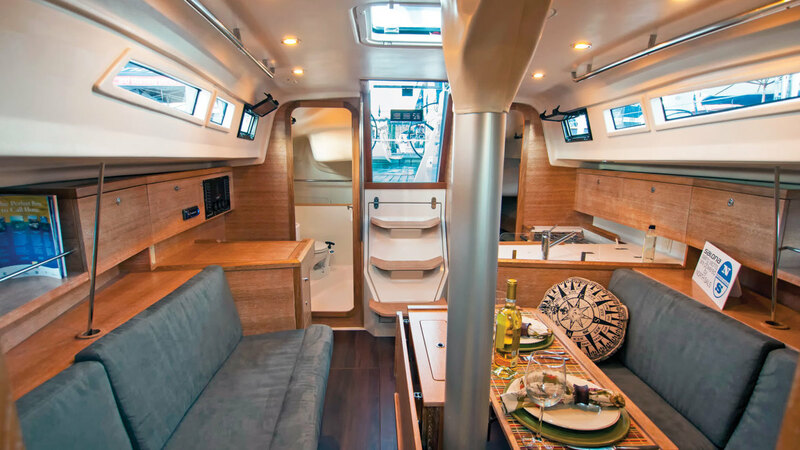 Amazingly, Salona has packed two cabins, one head and a compact galley into 33ft. The forward-facing nav desk is almost old-school with today’s dependence on multifunction displays, but it will be appreciated by any skipper who longs for a space dedicated to navigation and other ship’s business. Below the desk is a locker for manuals and tools. There is plenty of room for navigation and communications equipment to be mounted outboard at eye level. B&G electronics can be specified as an option. Two straight settees to port and starboard face one another to either side of a drop-leaf table with built-in bottle stowage. The table also folds neatly out of the way when not in use. Aft to port is a workable L-shaped galley with a two-burner gimbaled stove/oven combination, a sink and a top-loading fridge. The forward stateroom offers plenty of stowage space, including a nice hanging locker fronted by a seat for tucking away gear. The aft cabin is either spacious for one or cozy for a couple. On the plus side, there’s good ventilation with an overhead hatch. The head is aft to starboard. Although it has no stand-up shower stall, it does include a useful combination wet locker and bin. The placement of the toilet paper holder, however, may result in a few lost rolls if you drag wet foulies over it into and out of the cubby. The interior finish on our test boat was bleached oak and offered a heavily textured beige color that may not appeal to the American market. A more traditional mahogany veneer finish comes standard. Two hatches, opening ports in the cabintrunk, and six fixed ports in the hull provide light and ventilation. Other than water tankage, which is only 26 gallons, there is really no tradeoff below, and a couple with or without friends could spend a summer weekend aboard in both comfort and style. With a one-foot wind chop and a breeze of 8 to 12 knots, we had ideal conditions for a performance-minded boat like the Salona. We tacked through 80 degrees and sliced cleanly through the waves. At 45 degrees, we were able to push up to 5.8 knots of boatspeed in 9 knots of breeze. On a beam reach in 12 knots of wind, we were rewarded with 6.4 knots of boatspeed. Every turn was effortless, and the sheeting angles were tight due to the inboard placement of the genoa tracks. Sightlines forward from the wheels were excellent, and the helm was instantly responsive. I could easily see myself taking the 33 out for a quick afternoon sail alone, which is always a plus for anyone who doesn’t have much time to coordinate a crew. Auxiliary power is provided by a 21hp Yanmar diesel with a saildrive leg. The insulation in the engine compartment keeps the sound of the small engine at quite comfortable decibels. A two-blade Gori folding propeller is standard. On flat water with little breeze, we motored back to the slip at 5.7 knots at 2,900 rpm. Tankage is sufficient, with 24 gallons of fuel.